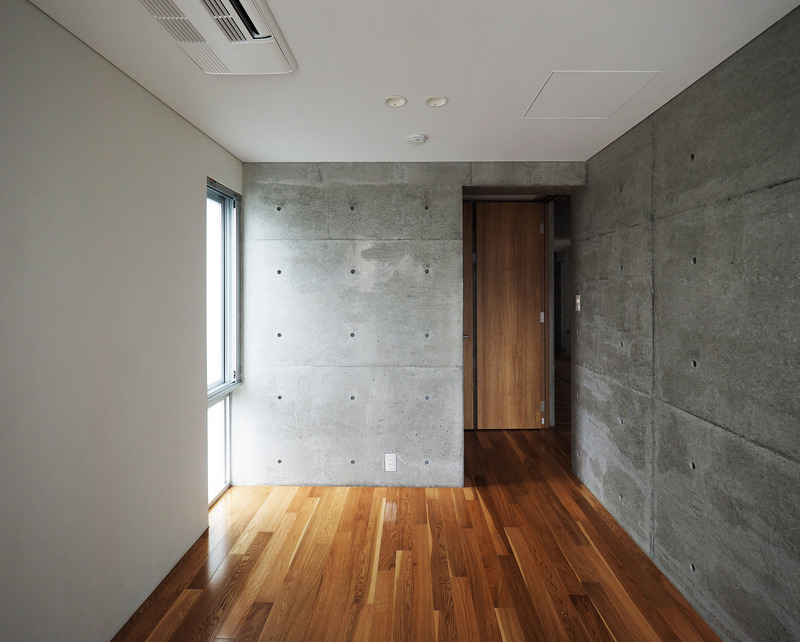 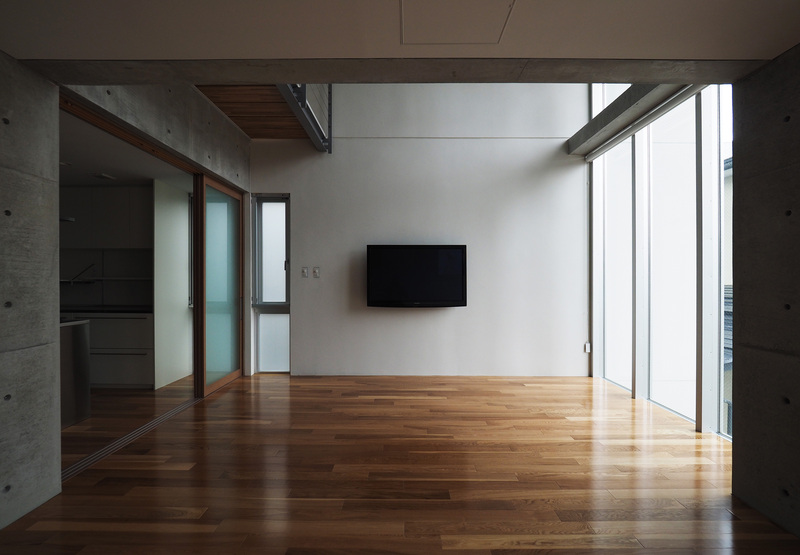 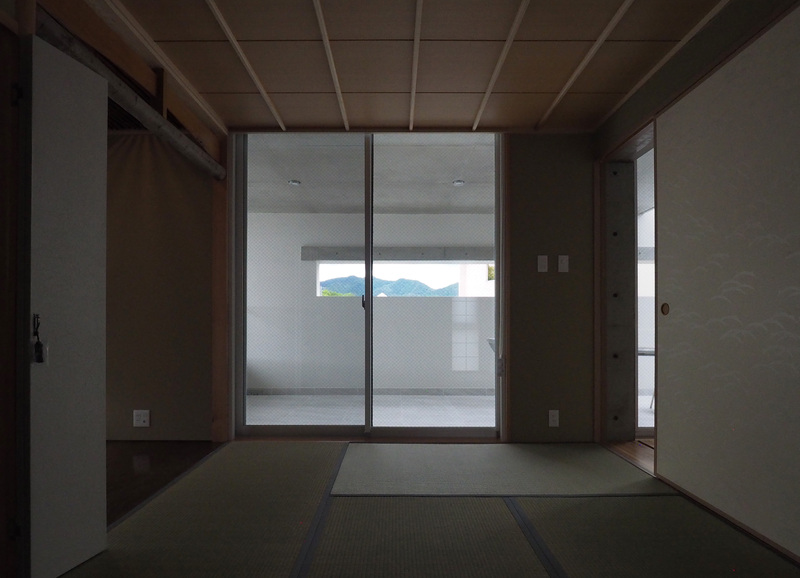 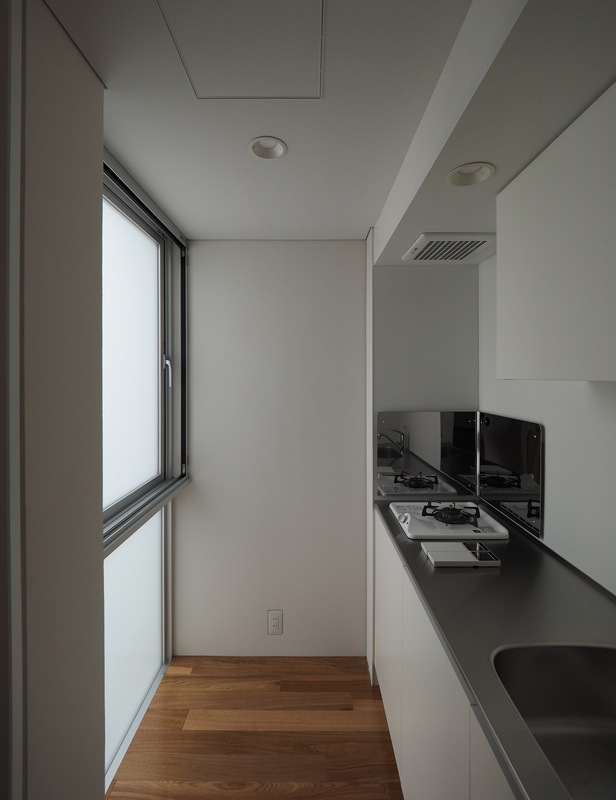 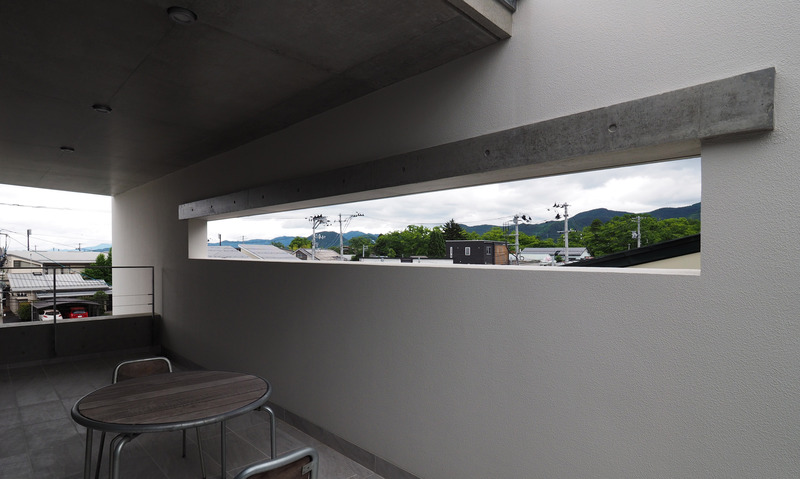 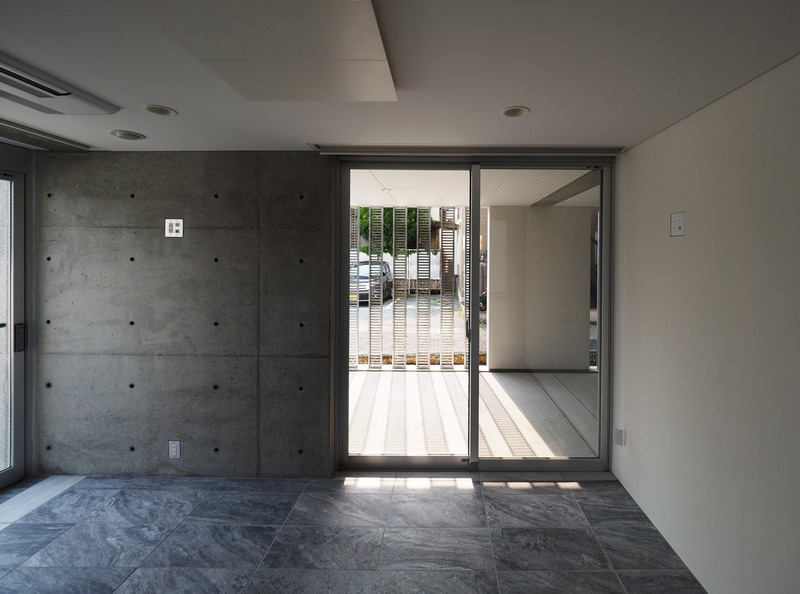 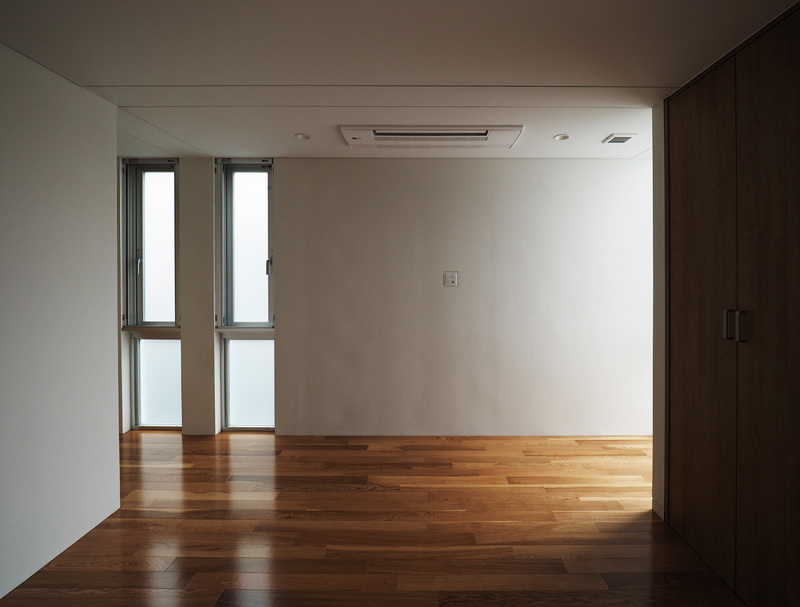 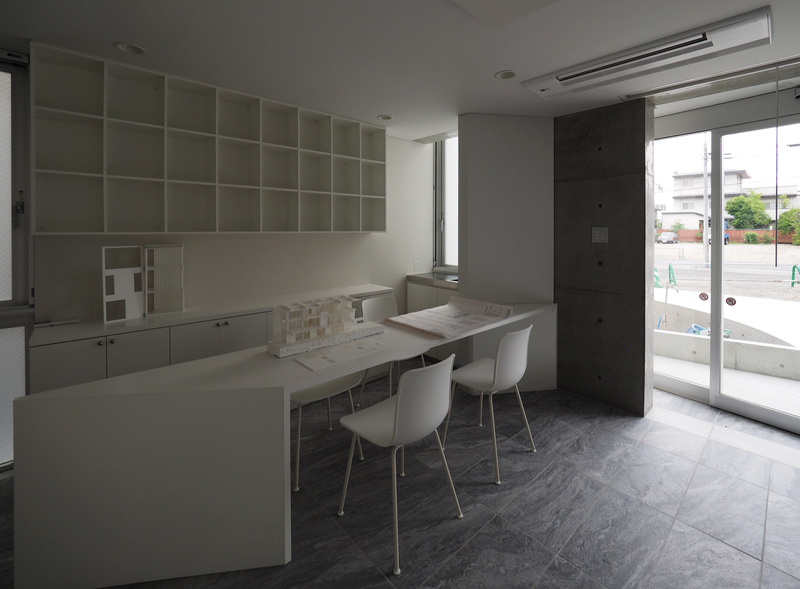 Townhouse in Muikamachi of Yamagata City I recently designed was completed and was delivered to the client on June 1st, 2017. 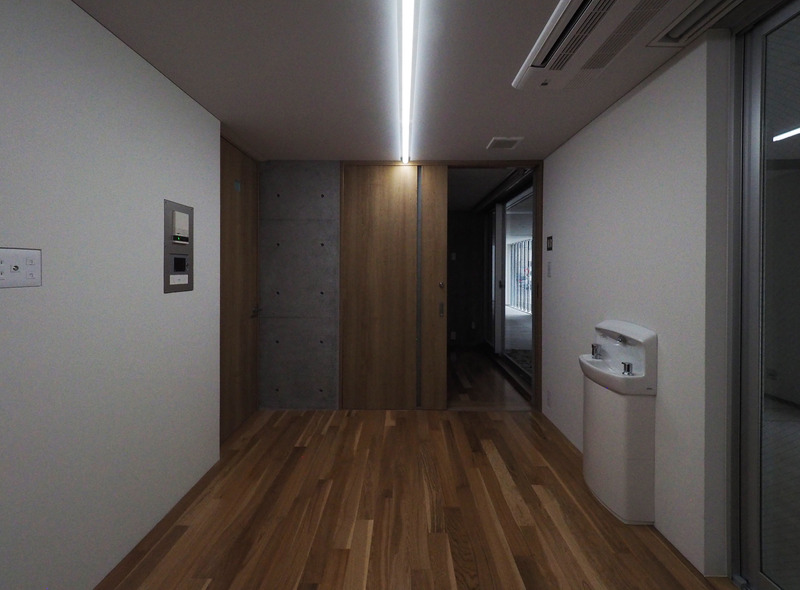 I post the extrior / interior pictures of the building, commentary etc with approval of the client. 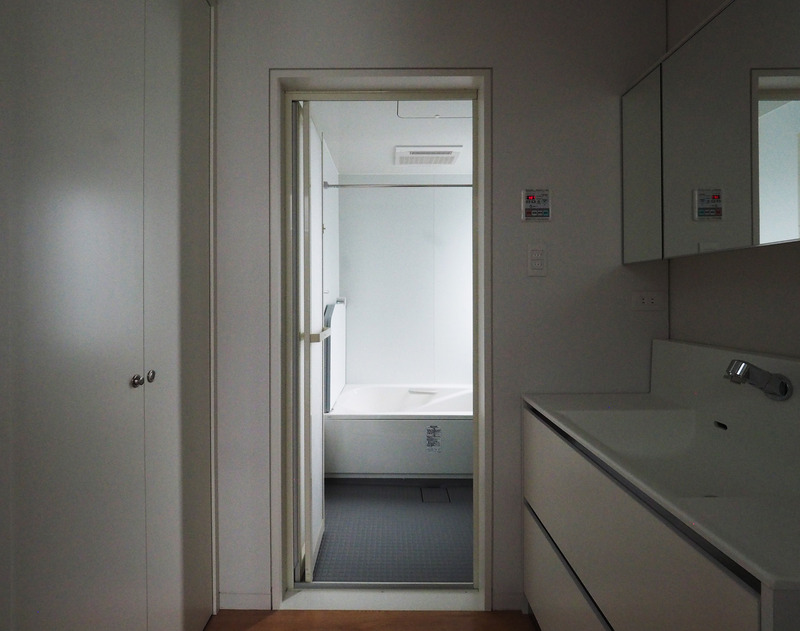 1階玄関から3階テラスまでを貫く吹き抜けの階段室は、階段式ギャラリーとしても使われます。 The staircase can be used as a gallery. 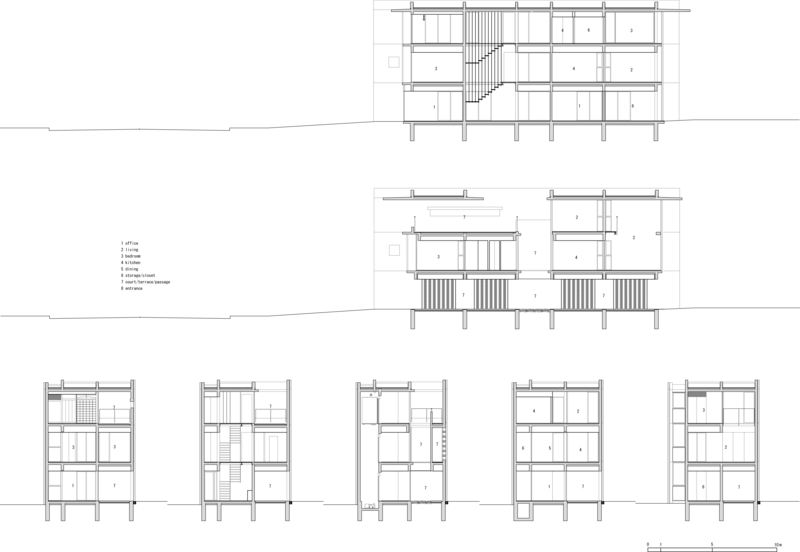 Thank you once again to the client who gave me the opportunity to engage in the design and supervision of such a challenging architecture, and to all the people involved in the construction work in response to a difficult request until the end. 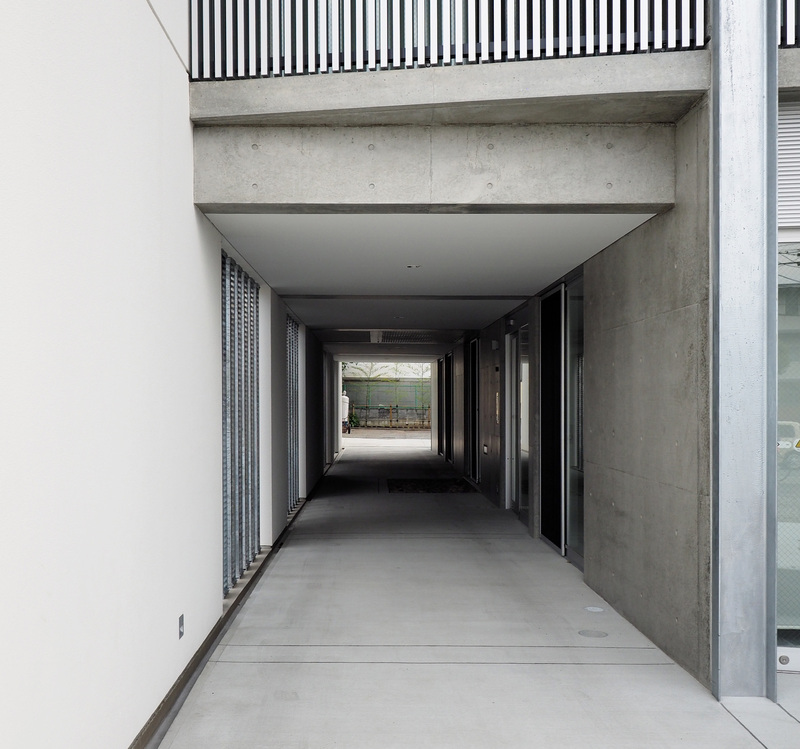 Complex of housing and office (store) for the family carrying on sales of liquefied petroleum gas and kerosene, and also running franchise stores of major cleaning services. 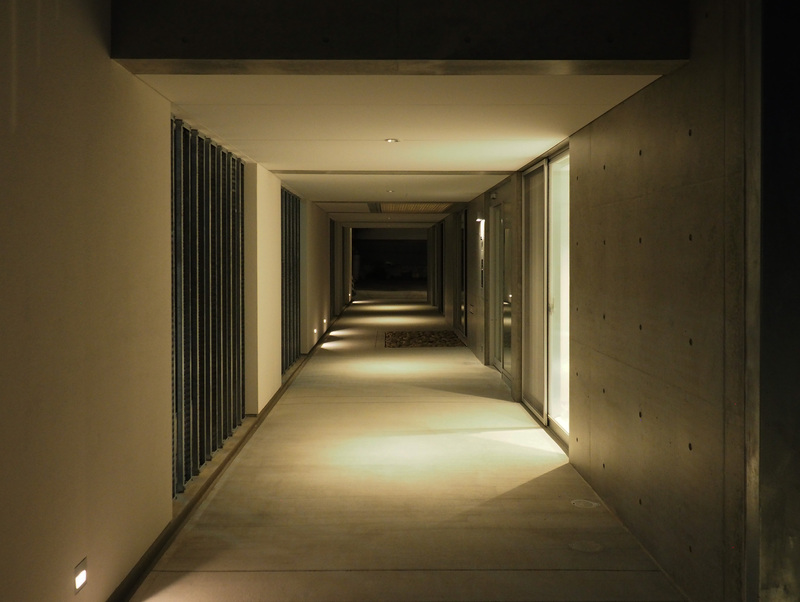 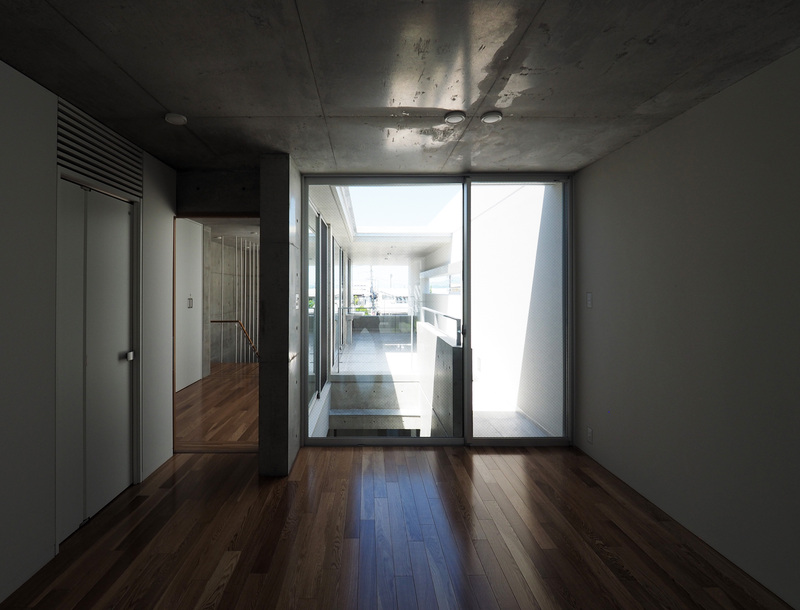 The first floor is office, warehouse and entrance of the residence, the second and third floors are exclusively houses. 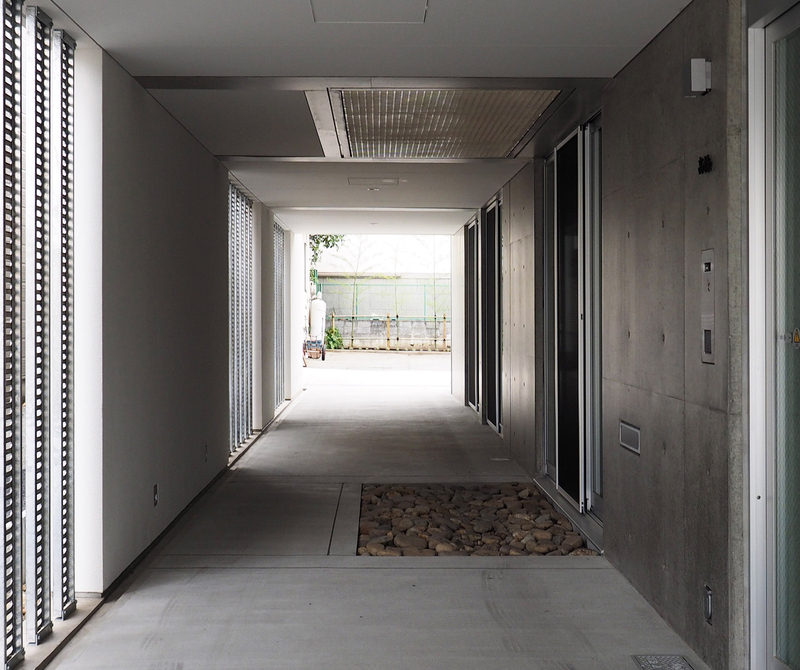 In this neighborhood, three days of May 8th to 10th every year, the Yakushi Plant Fair with the tradition of 400 years is done with the vehicle closed. 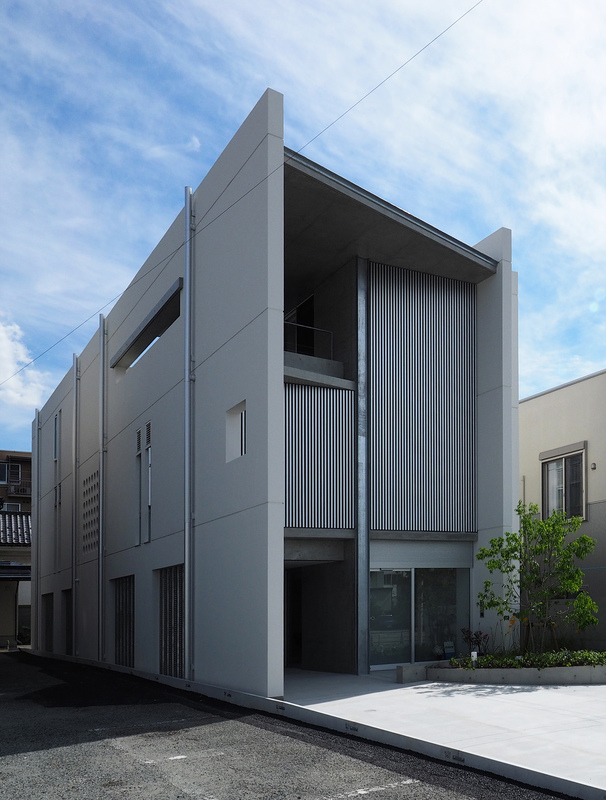 The front road is the main street to be the venue of the fair, and there are many buildings like this (complex of housing and store) handling daily necessities around the street. 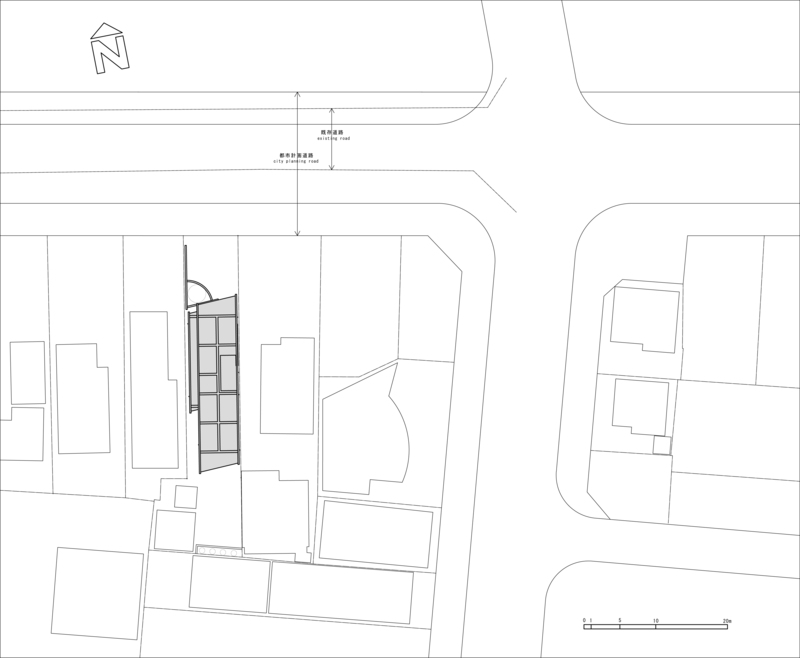 This whole roadside was requested to receive compensation from the city within a certain period, to setback and rebuild for a road widening work by city planning. 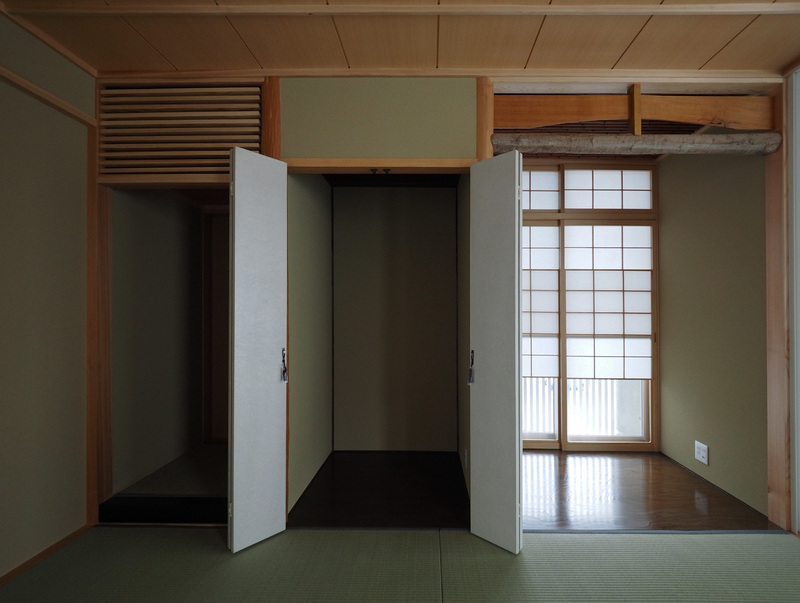 Also, since the Kokubunji Yakushido of the national historic trace faces the street, it was necessary to process the design with deliberations of scenery conservation. 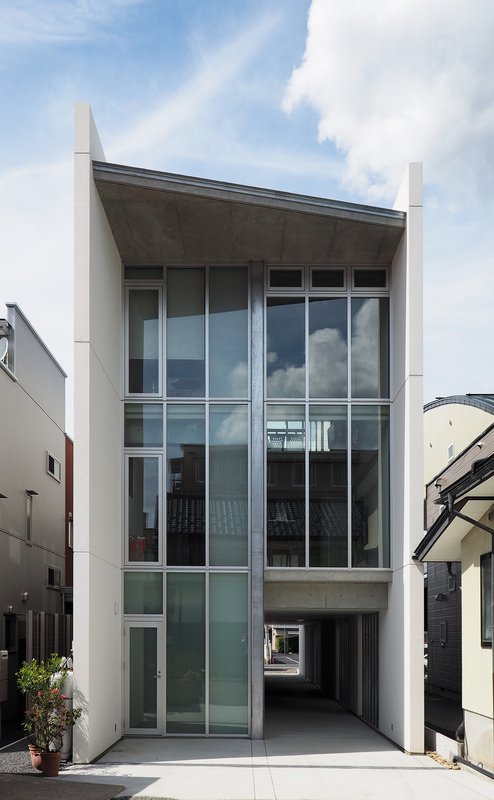 When we had a design meeting with the owner, they requested the condition for the new building that a passage through the building leading from the north side street to the south side load handling place (and shed), which was also adopted in the original building they had lived, as the function was indispensable for running a family business. 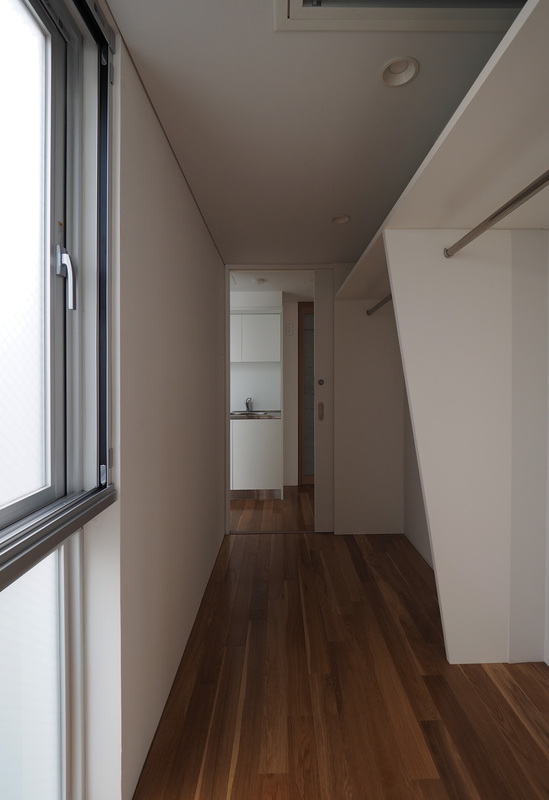 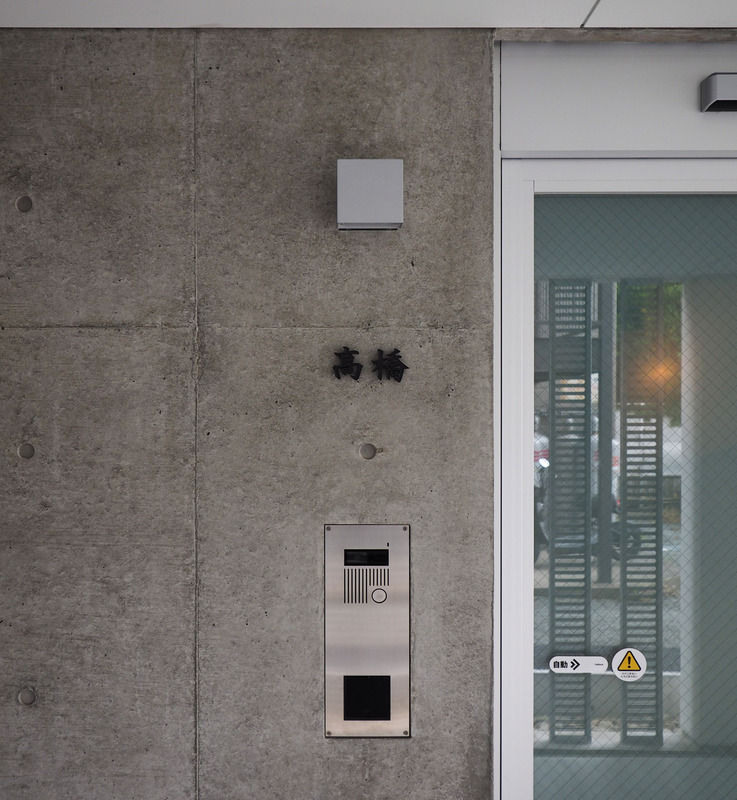 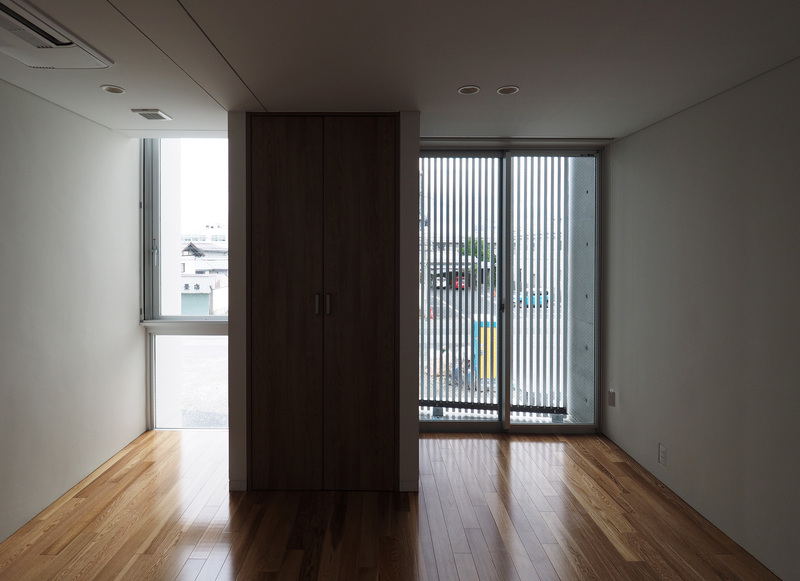 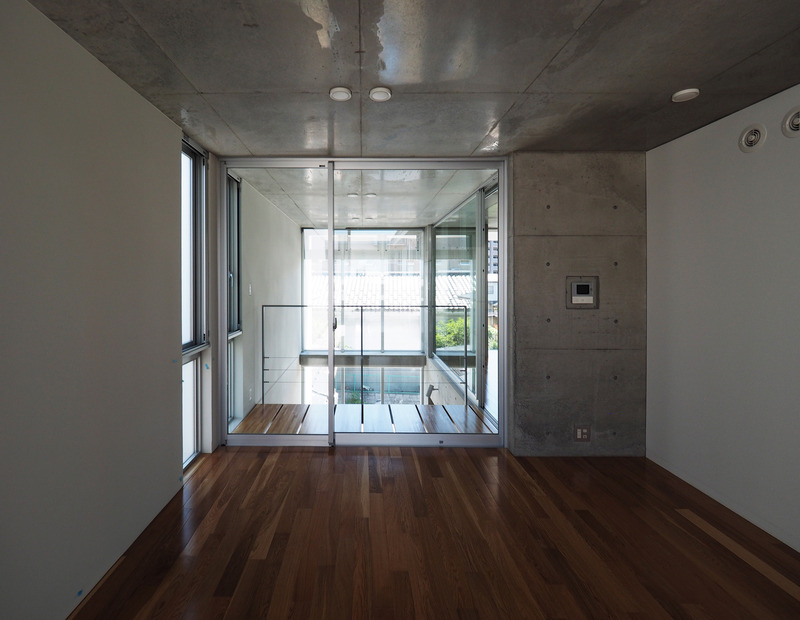 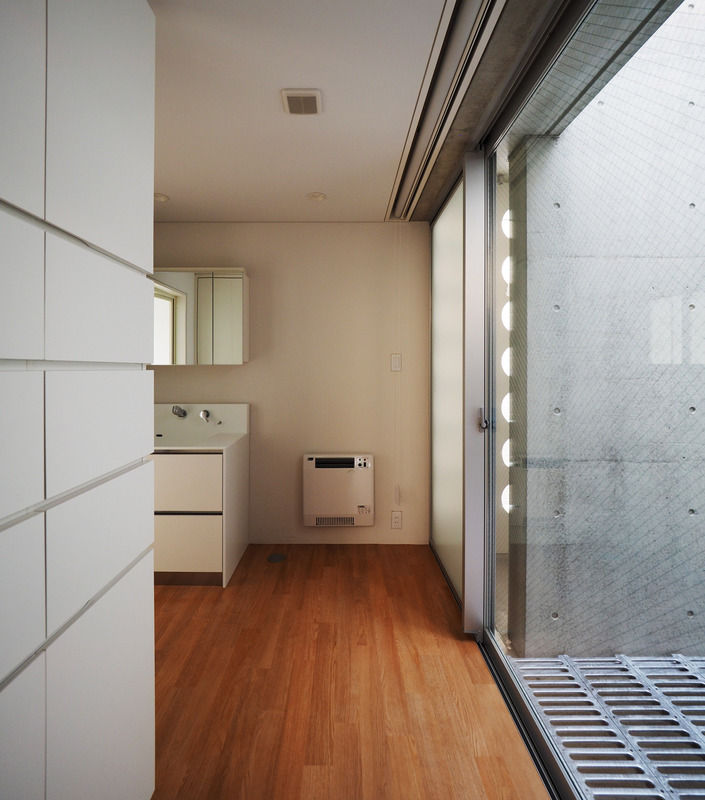 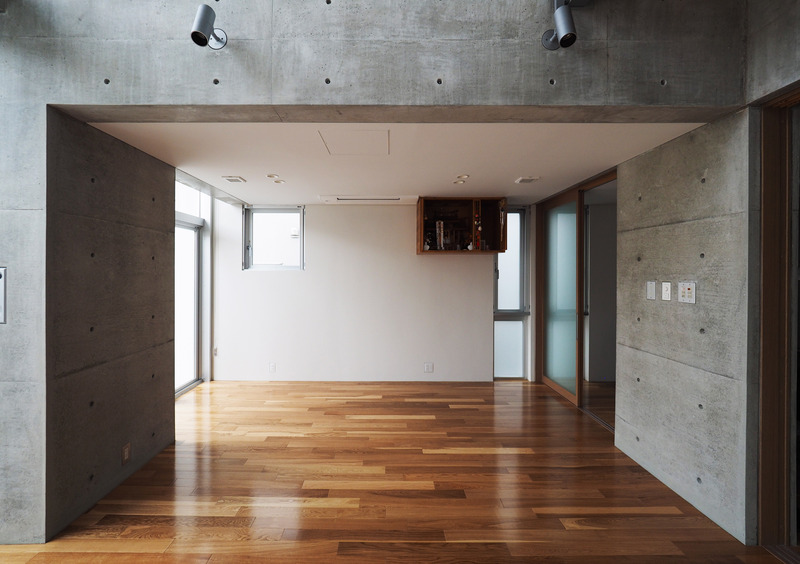 Besides, a home elevator was newly requested as a vertical flow line in addition to the stairs despite frontage of the site is not so wide. 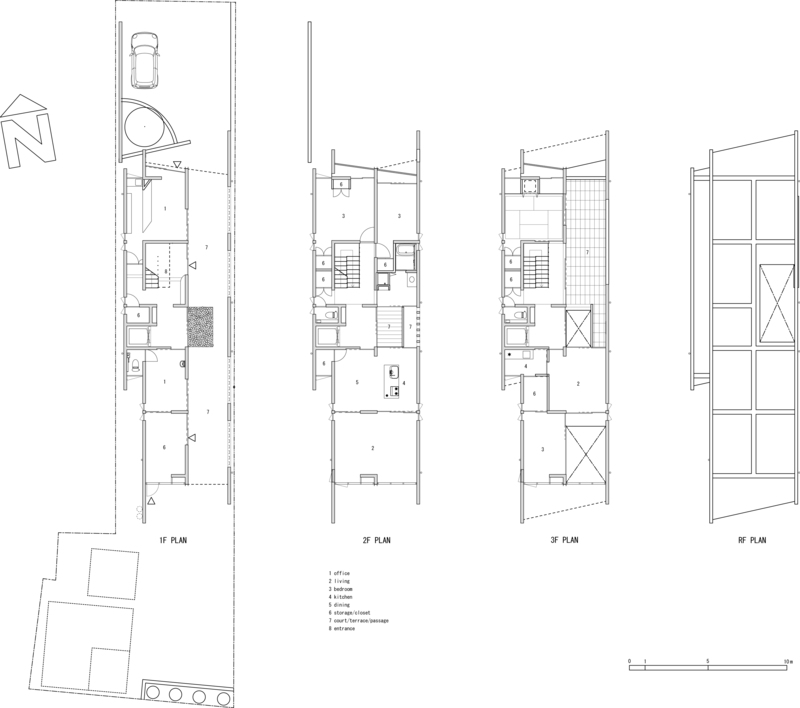 The site is an elongated shape through the north and south. 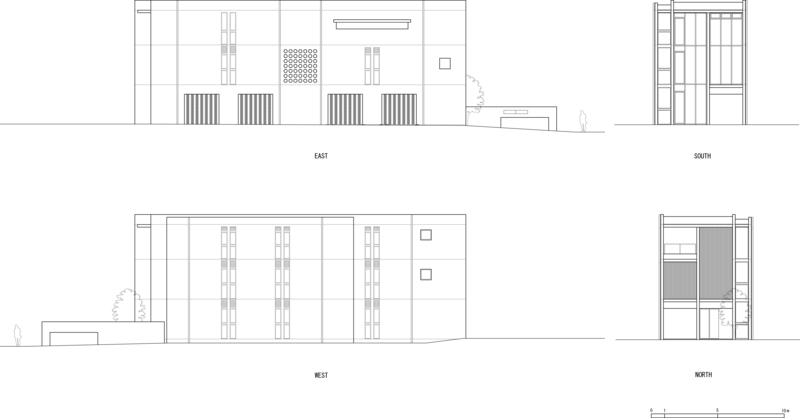 Majority of the site belongs to the neighboring commercial area of city planning, and adjacent buildings facing to the east and west might be planned up to the lot line in the future, and there would be a possibility that a midsection of the a building has trouble in terms of ventilation and lighting when we use only openings at the north and south sides. 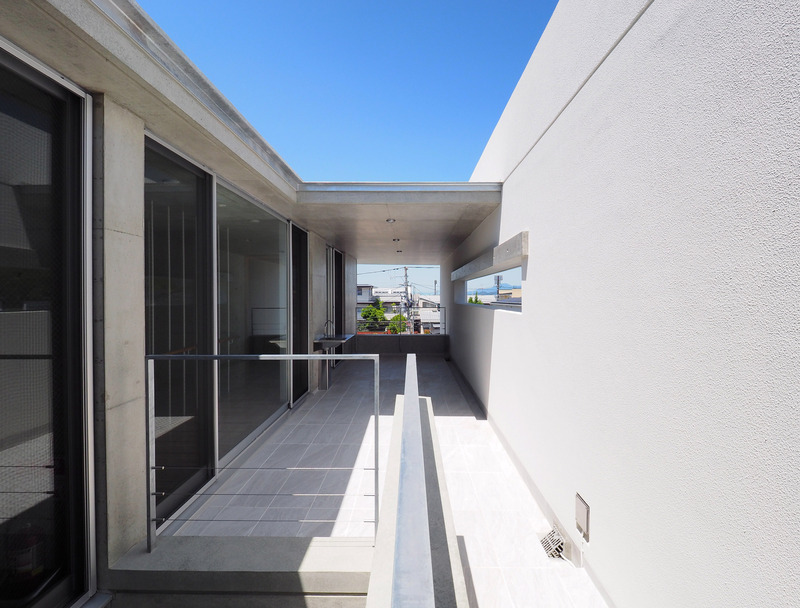 The passage corresponding to the request of the owner was placed at almost the same position as before, and a courtyard which passes through to the sky was set up in the portion corresponding to the center of the passage. 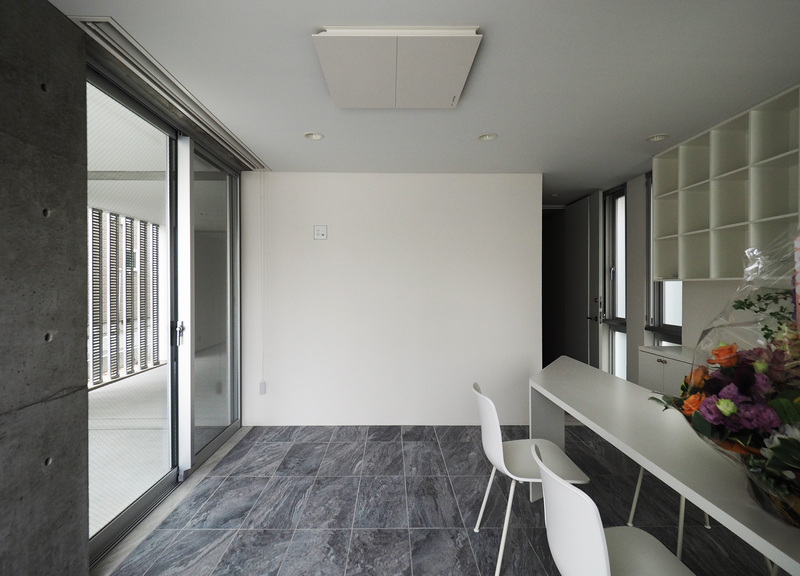 In this way, we made it possible for the entire building to breathe. 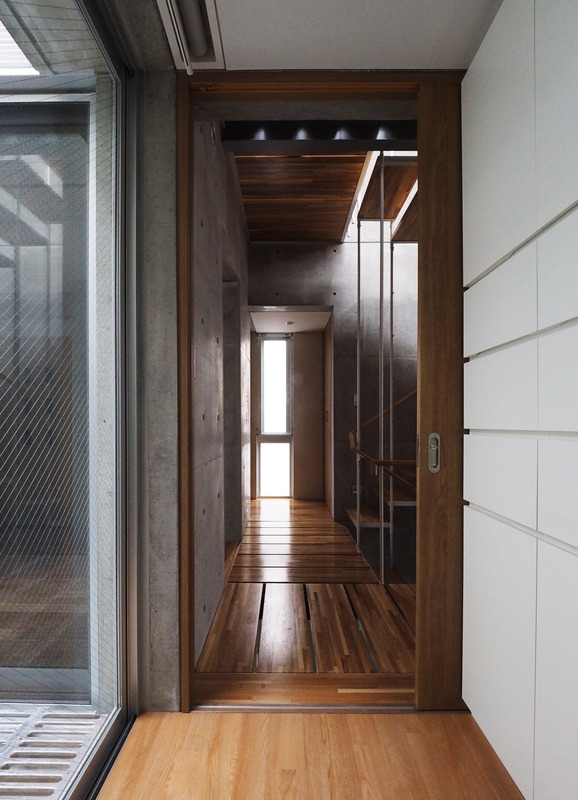 We set up elevator halls of every floor facing this courtyard and it was also made composition which serves aisle to dining room and living rooms from the staircase. 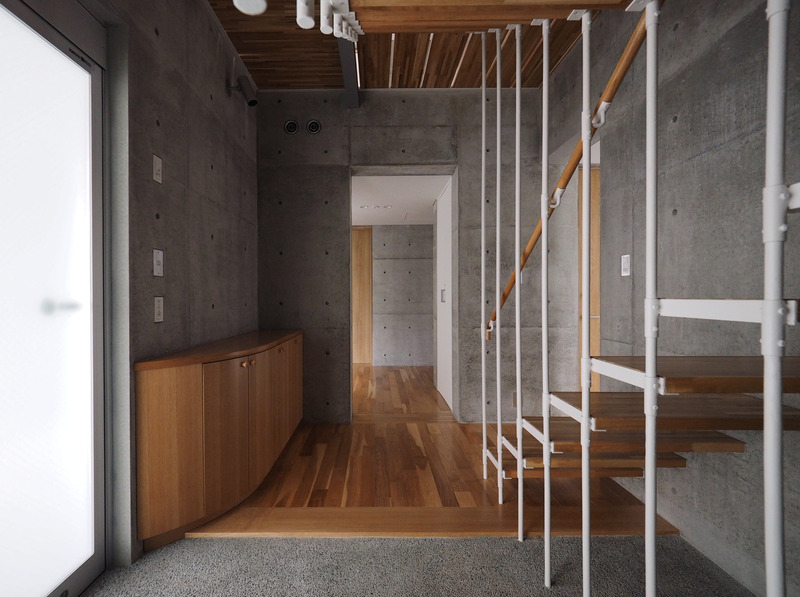 Like the courtyard, the staircase is a certain another vertical void in this building. 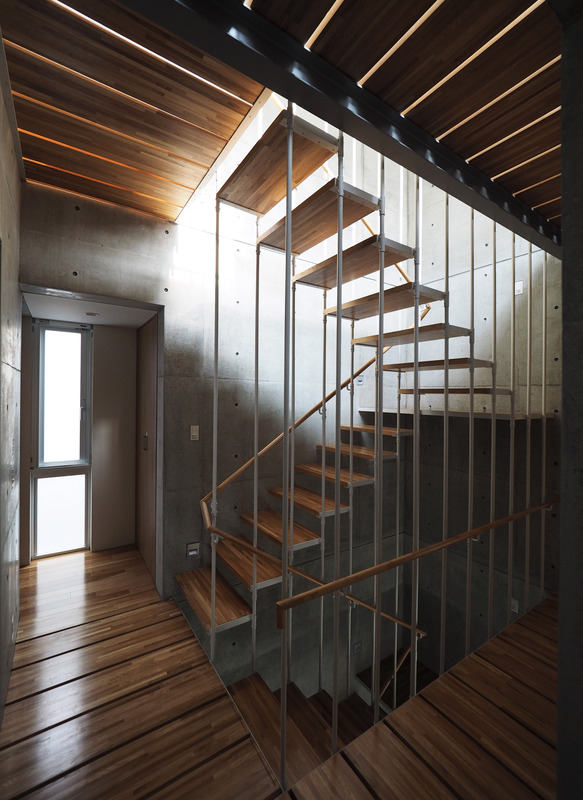 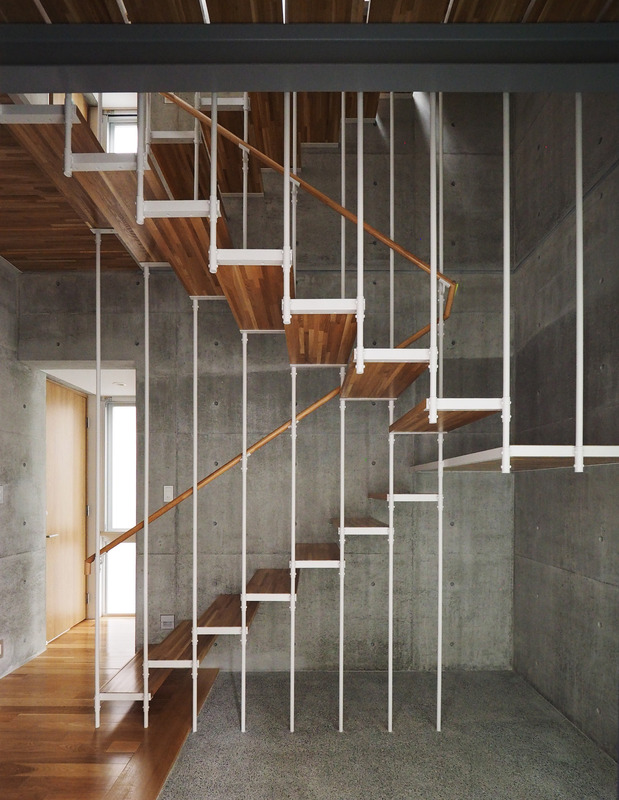 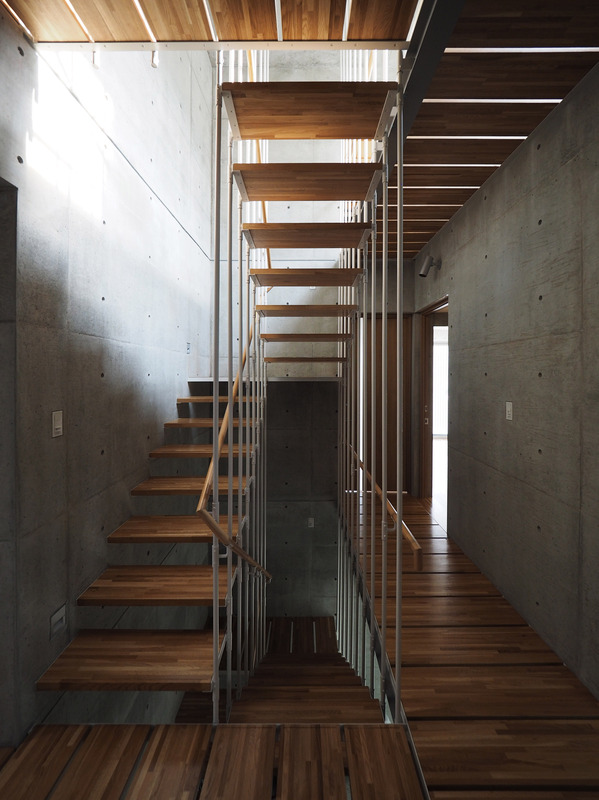 In this staircase, as a frame of RC, it is a three storied space with no floor, and there is a stairway (partially a passage) that is composed of hanging rods made of steel round bars and tread boards made of wood. 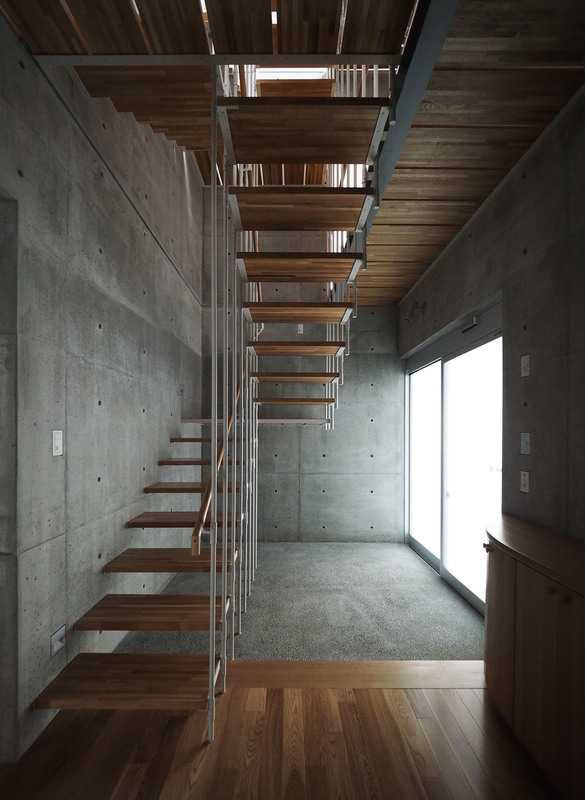 Except for this staircase, in this building there is no space only for the flow line, it is an extremely compact configuration in which fixed target spaces are connected directly and fluidly. 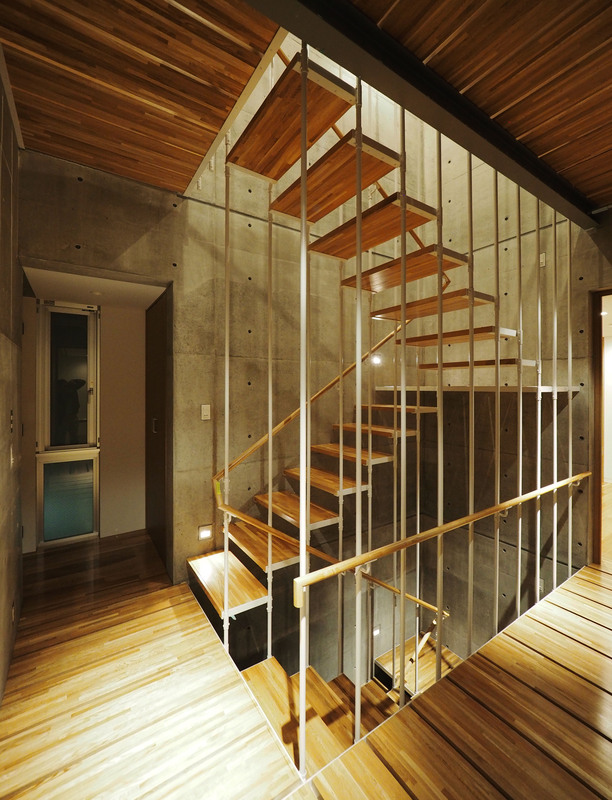 (It would be ideal if the staircase also displays paintings like a stair-type gallery.) 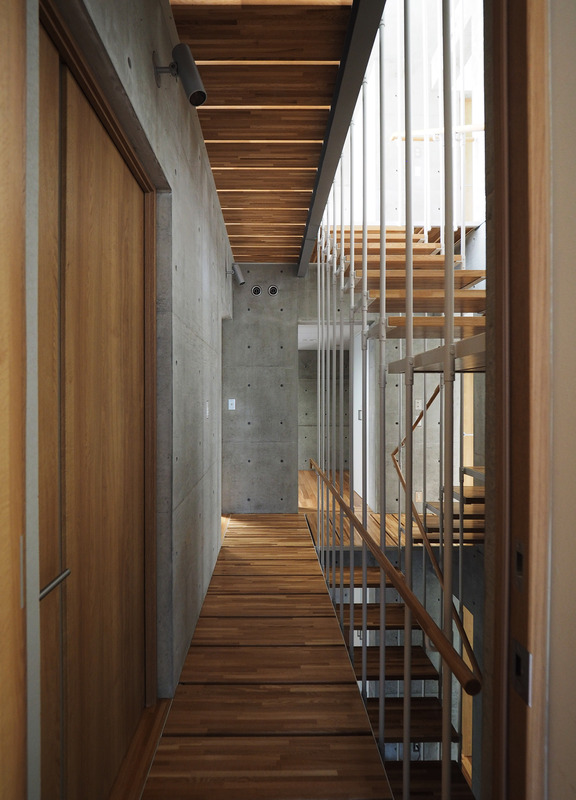 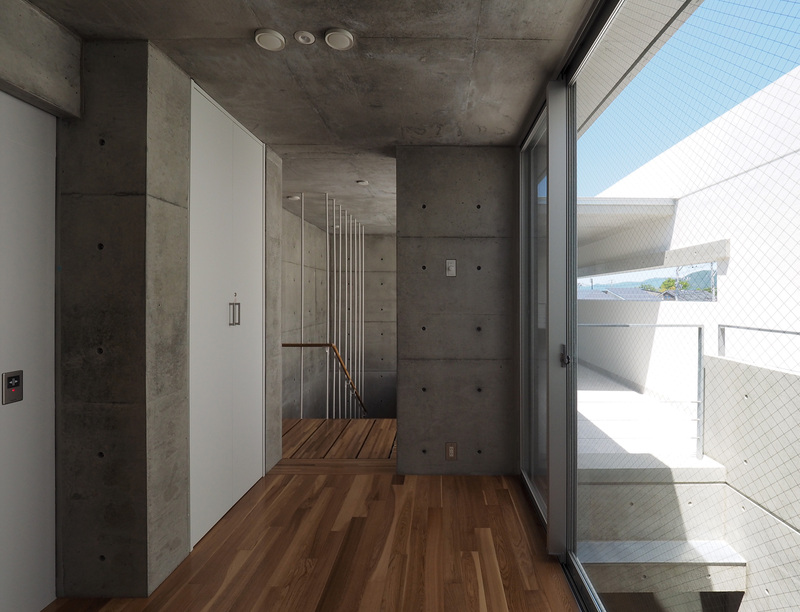 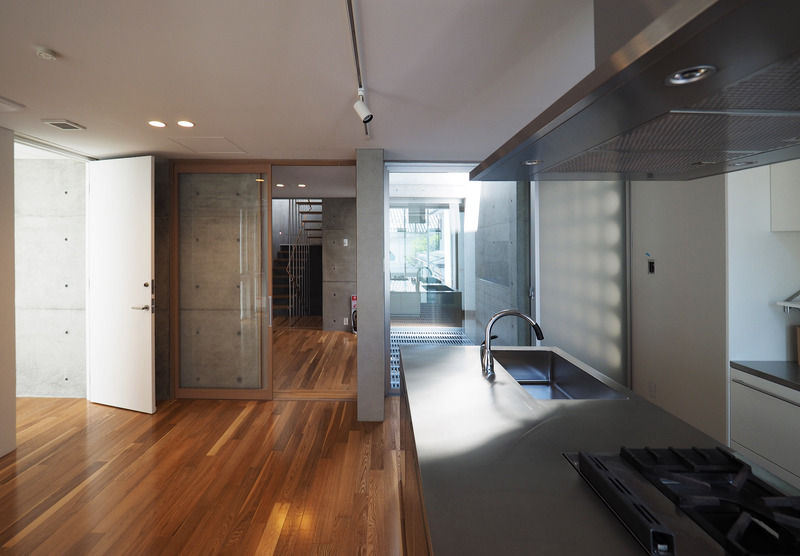 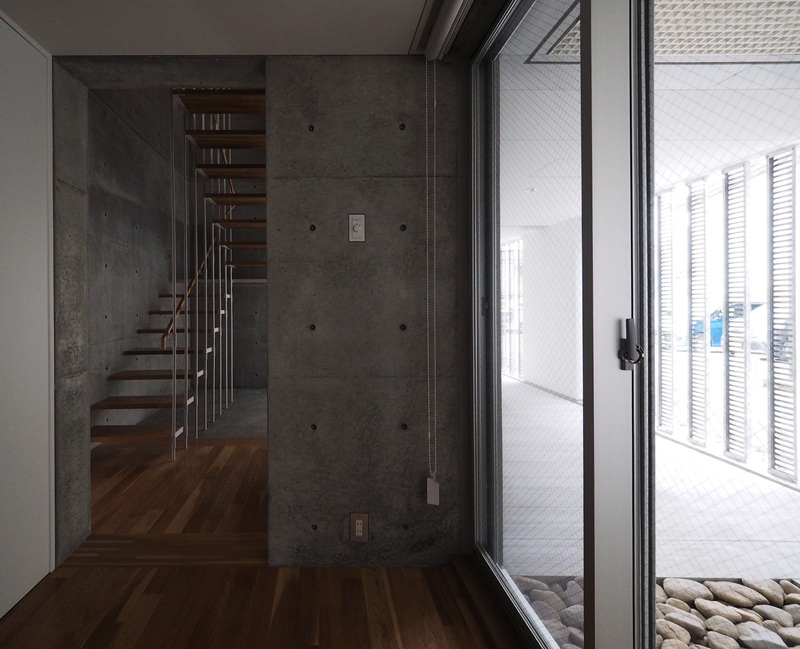 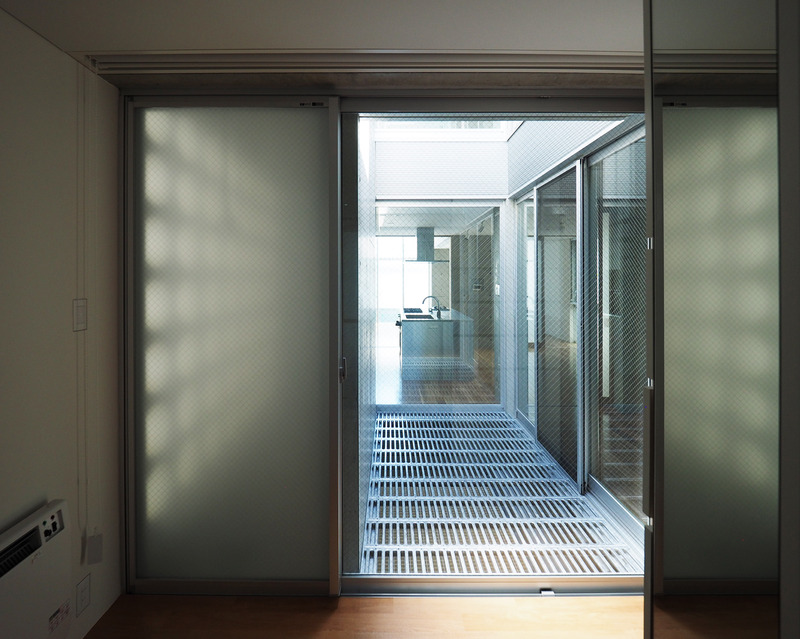 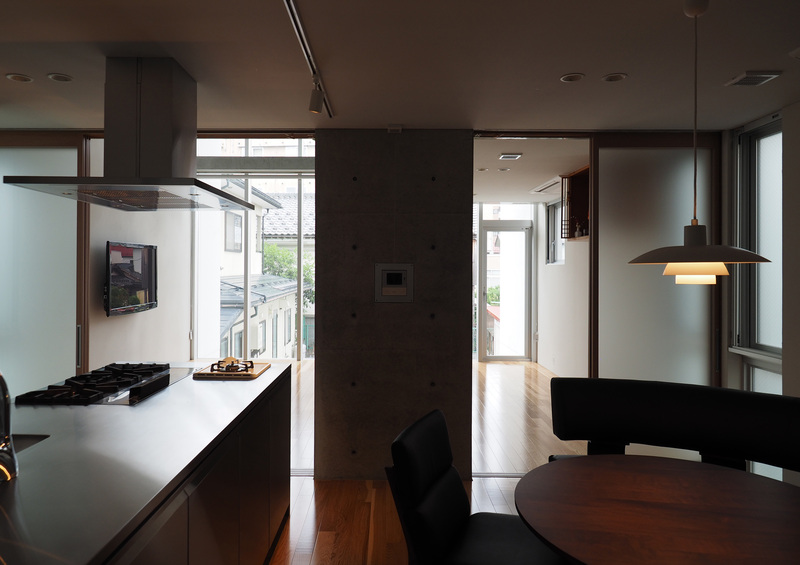 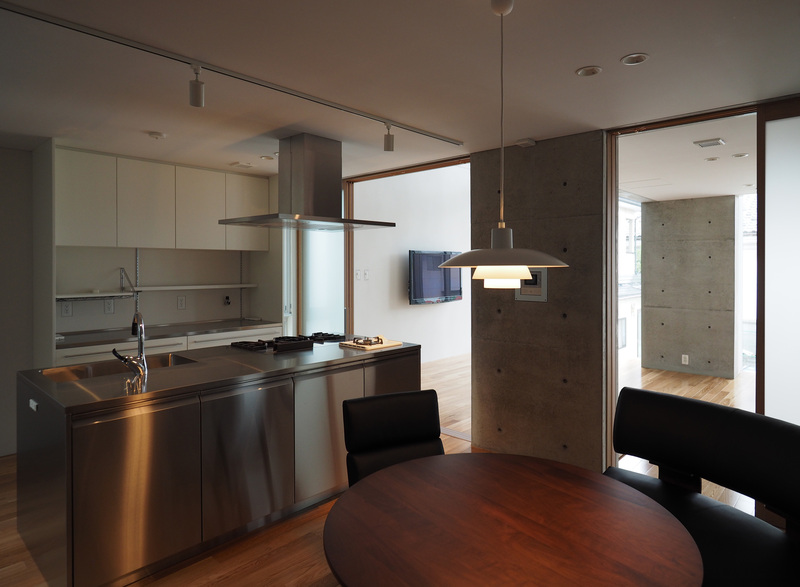 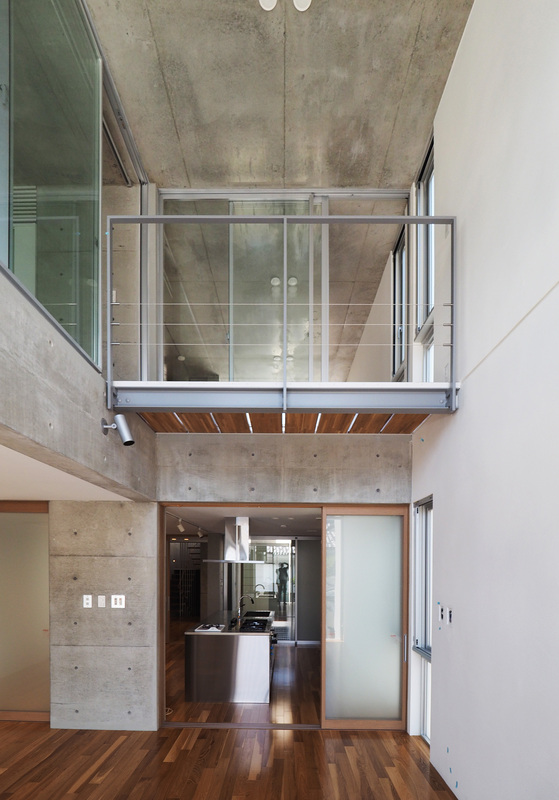 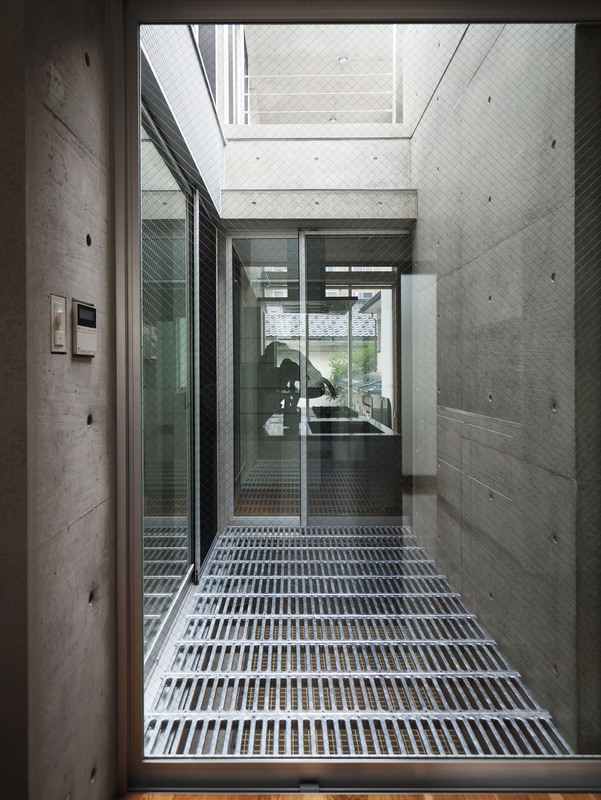 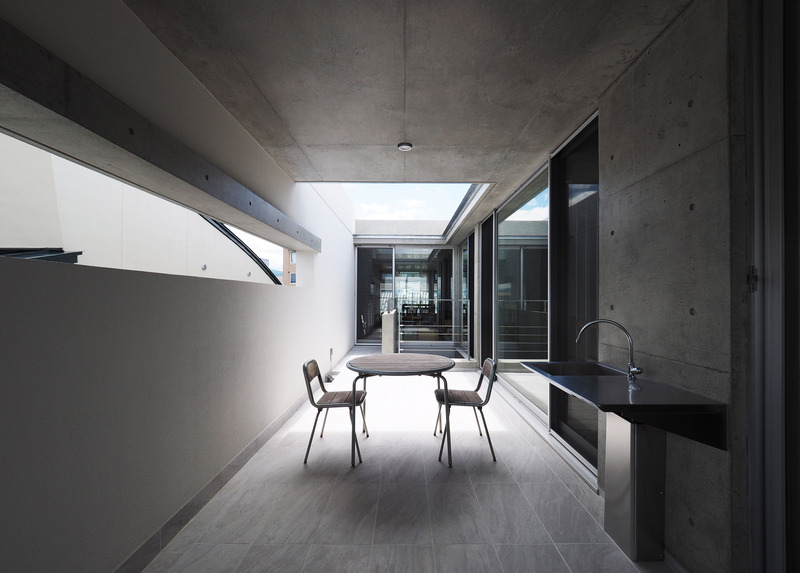 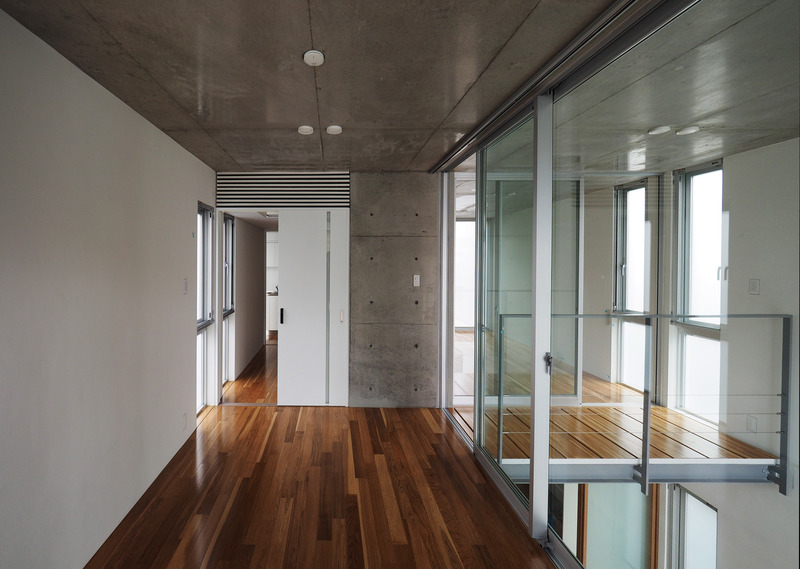 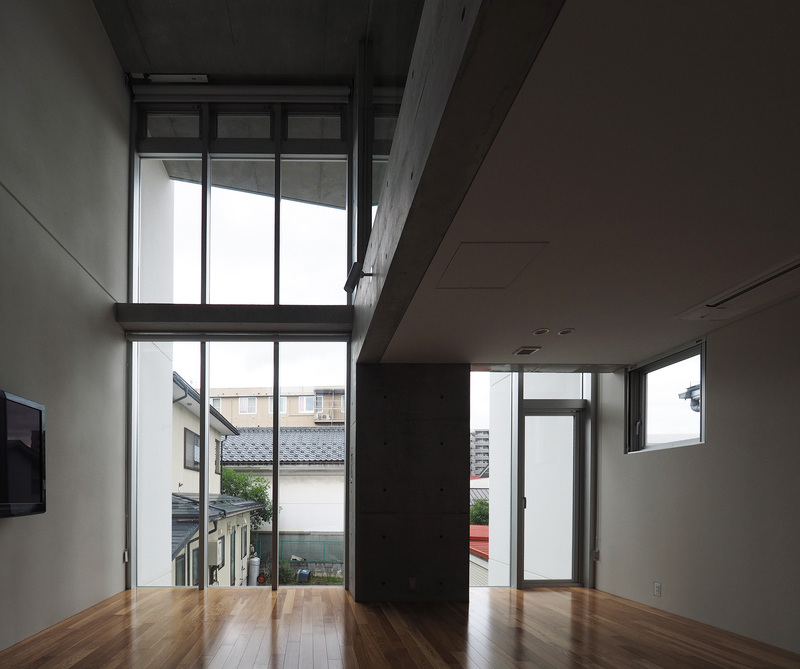 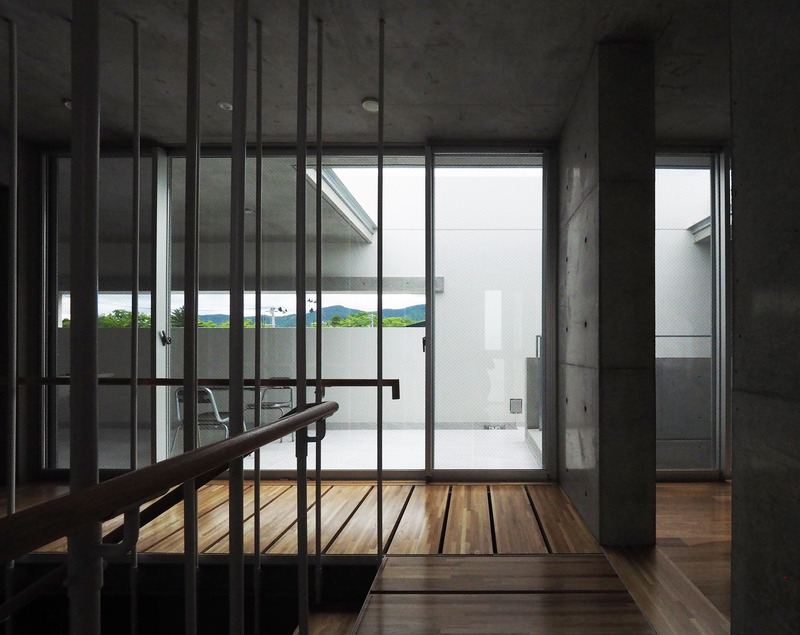 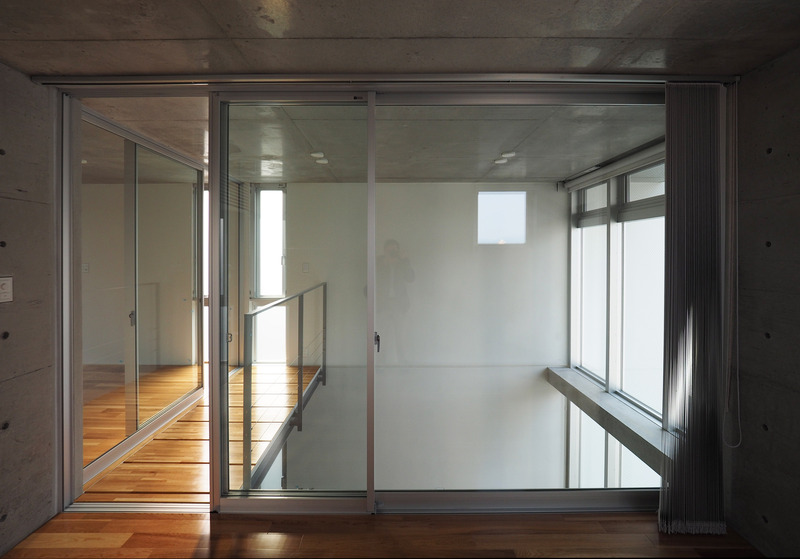 The third floor part of the staircase is wide open to the terrace and natural light pours downstairs from its opening. 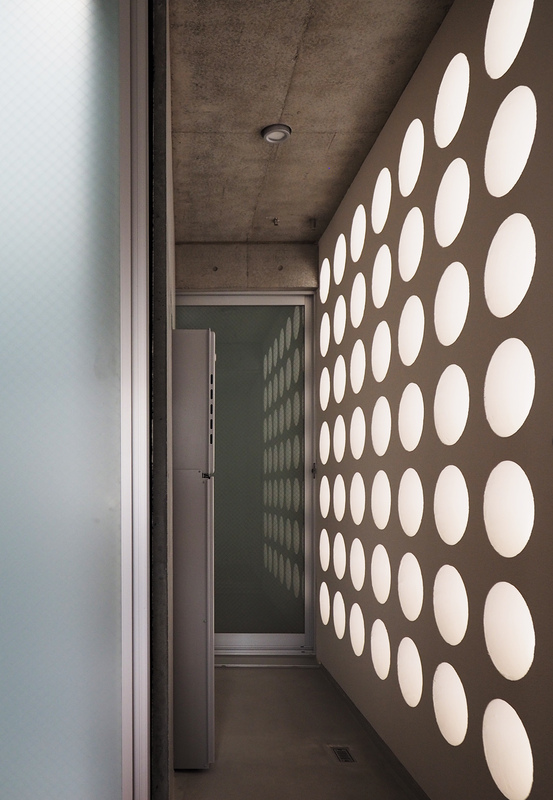 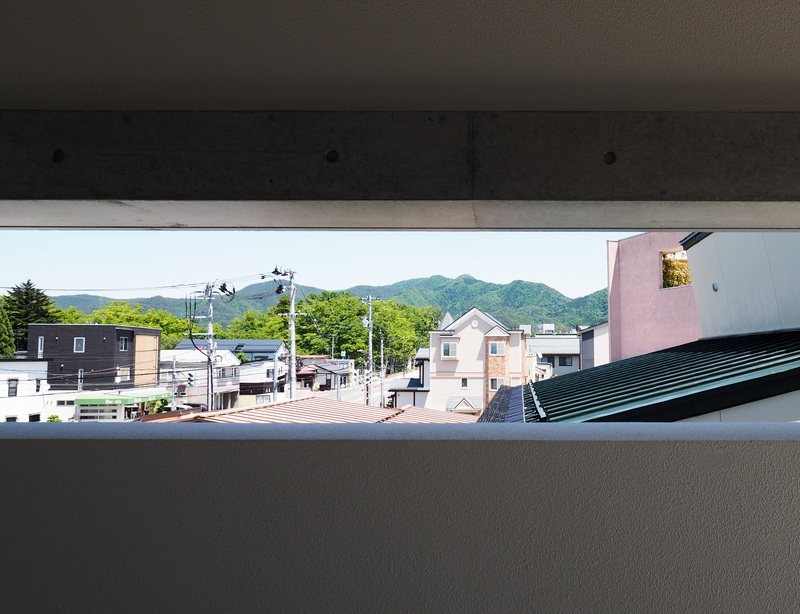 The outer wall facing the east-west boundary was finished with very thin thermal insulation resin paint stemming from the technology of space rocket both inside and outside, and the walls in the middle of the building were chosen to be left as exposed concrete. 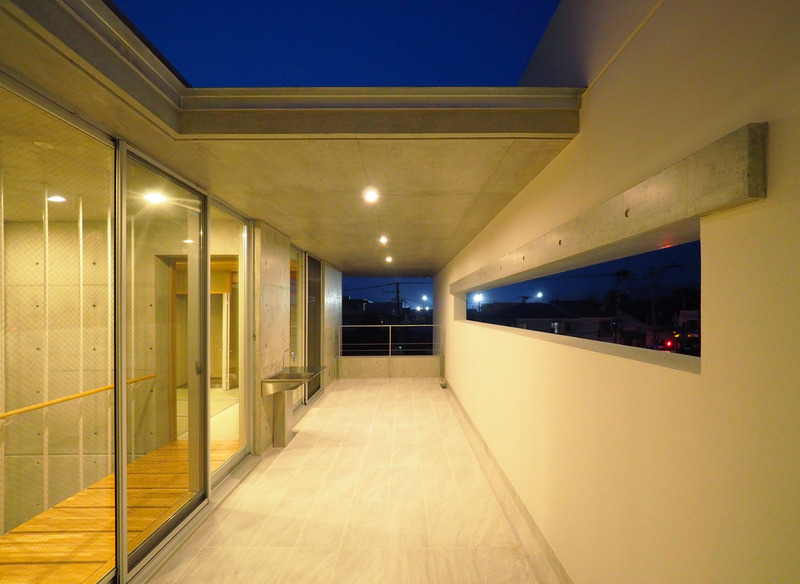 The roof of top floor is insulated and waterproofed, and the ceiling is exposed concrete. 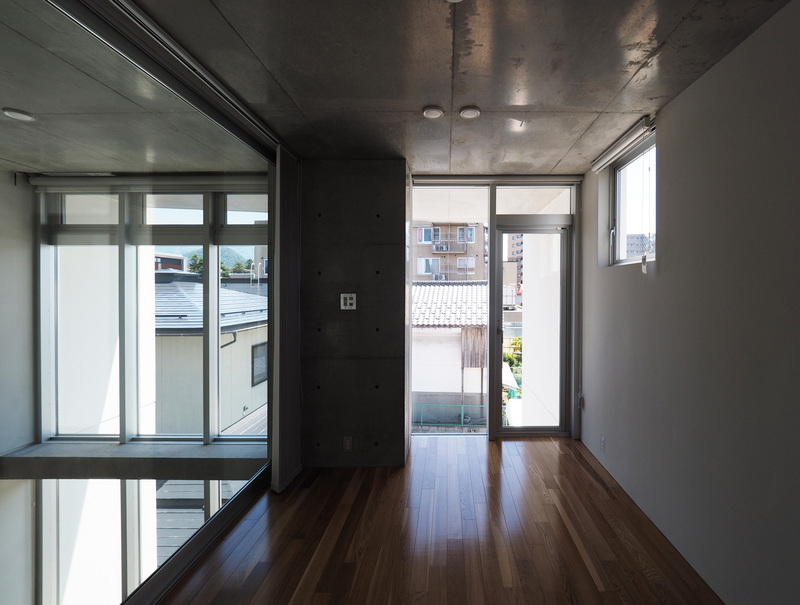 Heat insulation is applied to the outer periphery of the building, and the exposed walls and slabs inside will work as a heat storage layer. 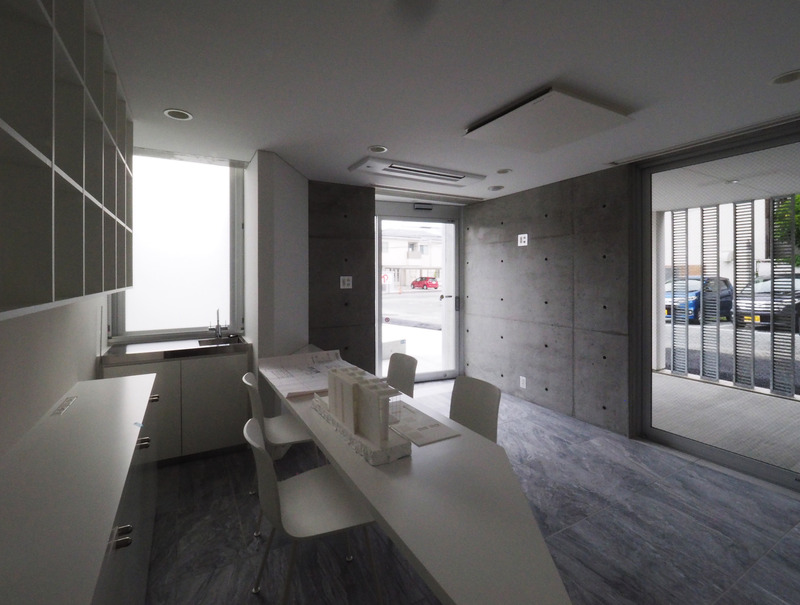 Among various constraints in the city, we sought how to realize flexible, comfortable and luxurious space with economic consideration taken into account. 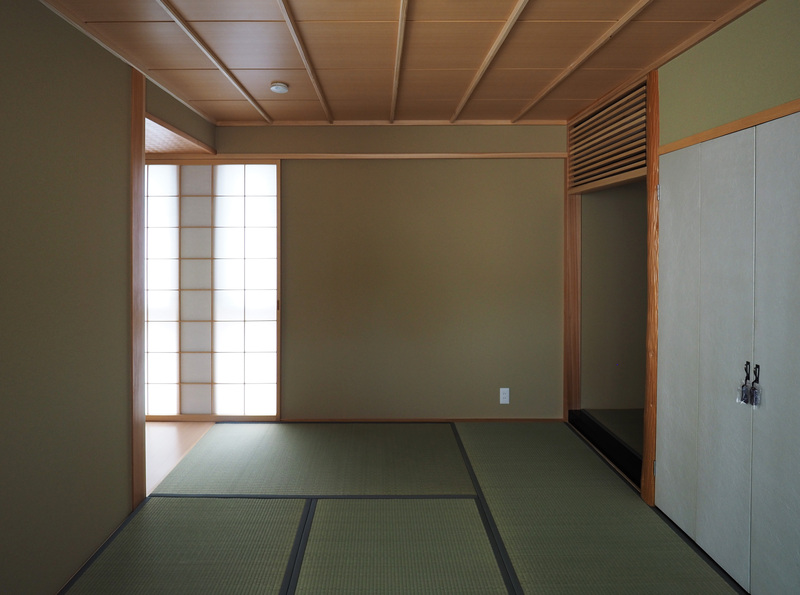 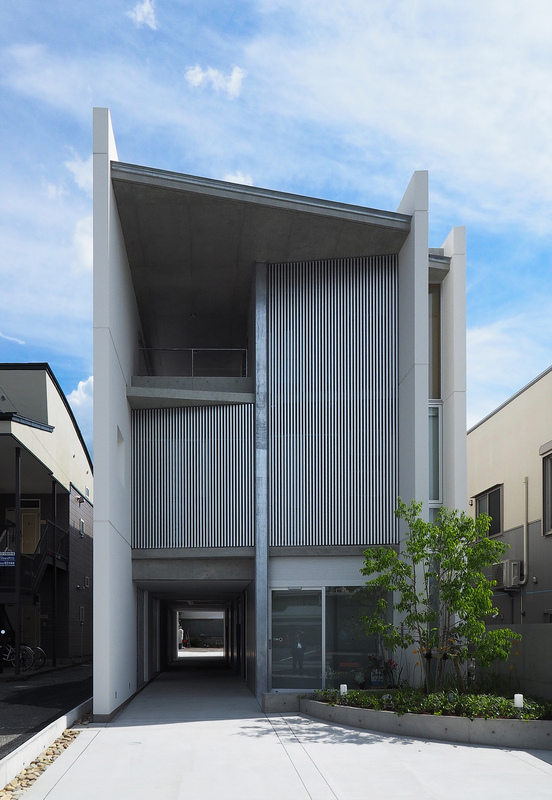 While I pushed forward upon design, I noticed that space composition of the building looked like Japanese traditional townhouse in Edo era with vertical void and horizontal void. 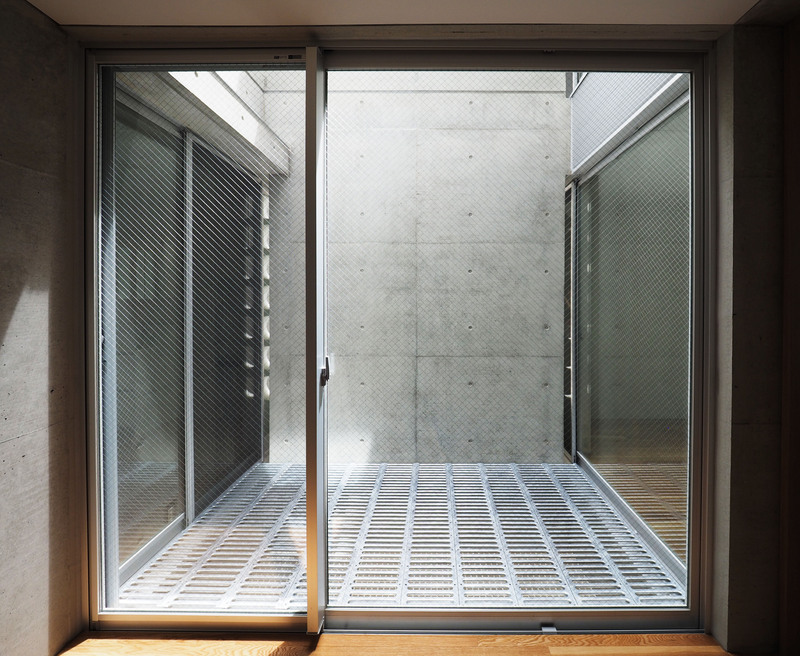 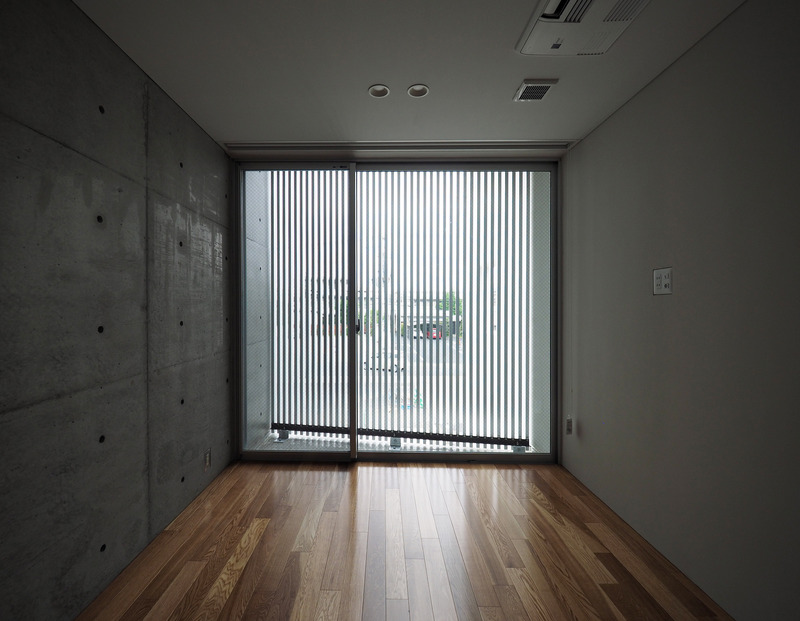 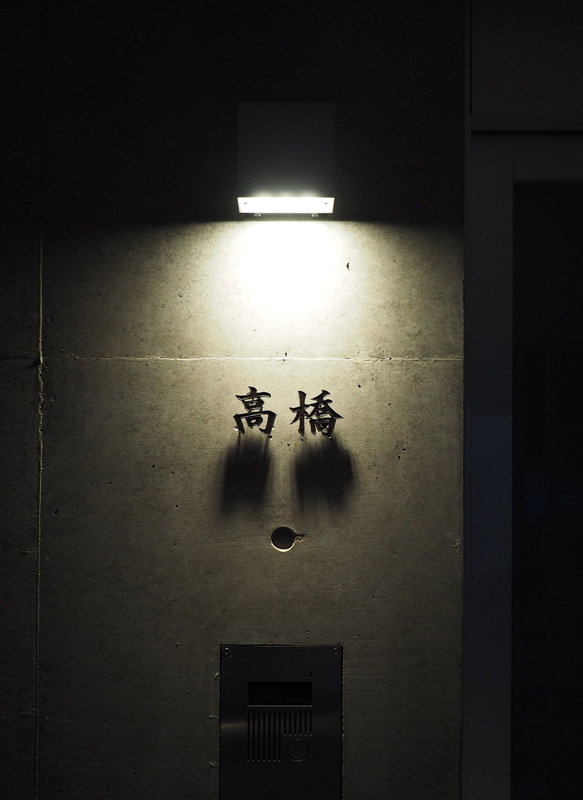 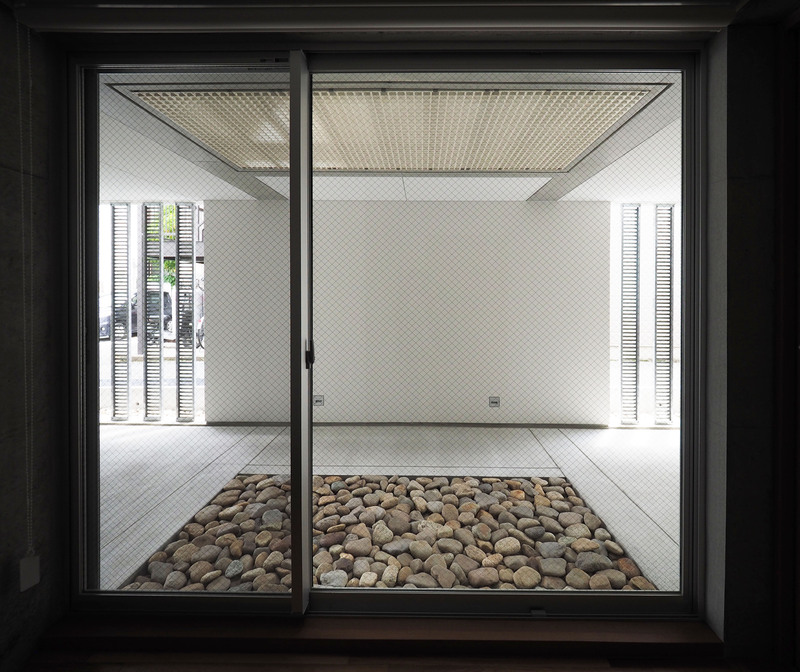 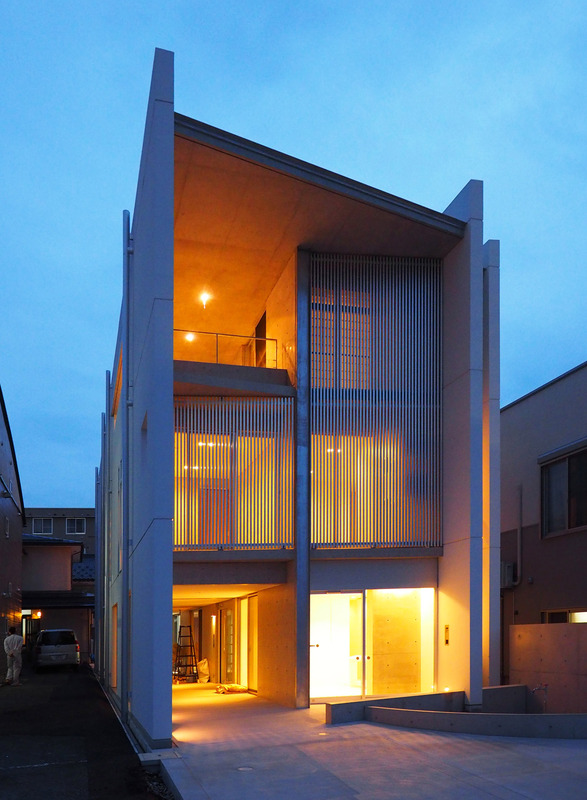 Also, I adopted a vertical gridded facade design via a view deliberation in historical streets, the atmosphere of the building had been getting more like a Machi-ya (Japanese traditional townhouse) while being an RC-made modern architecture.